Presents!!! Weeeee!!! Actually I don't get a ton of books for presents. I buy them for myself as presents but that doesn't count! In the past I'd ask for books for my birthday and such and my mom would get them for me (sometimes) but besides that most people assume I have everything and wouldn't even know what to get me! sweet books for presents and I try and do the same for her! One of the books she got me is called Dear New Girl or Whatever Your Name Is, is a book illustrating (by multiple artists) of notes found in Los Angeles schools from 1999-2002. This book is amazing and hilarious and really weird! And it popped up in my mailbox at a great time! I needed a cheering up! I think any sort of gift is special when it's from someone you care about! I love trying to find the perfect gift for someone but when I'm stumped I usually end up getting a gift card, some people are so hard to shop for! What's a memorable book you have received for a present? Every Christmas I like to add a bit of humour to the presents I buy. Last year I brought my best friend an orgasmatron head massager from need a present and it brought the biggest mile to her face. I like to gift books to my nephews and nieces. As for getting those...I prefer gift coupons nowadays! I love buying my daughter book gifts. She and I are the only real bookworms in my family, so I don't get to buy too many books for presents. I do like giving books as gifts too, its fun trying to find that perfect book for a friend or family member. 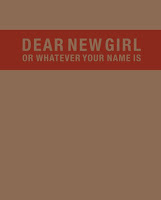 this compilation book looks fun - kind of reminds me of PostSecret. gautami tripathy- Yeah gift coupons are easier when it's hard to tell what the person may or may not have! anna- It's nice having someone to share your love of books with! veens- Yes, she's very thoughtful! just listen- Wow your mom does have good taste! Sure let's do a link exchange! naida- It is fun! I think I've had better luck in some cases and it's been a shot in the dark in others! dawn- It's really fun! There are some really random things going on in it! well my dear friend, i feel honored you chose my book as one of your most memorable gifts. that's why i love getting them for you; no one else receives them with so much excitement! luvs.